Drive in the lane with the least amount of traffic. If you are driving more slowly than surrounding traffic on a multilane road, use the right lane. 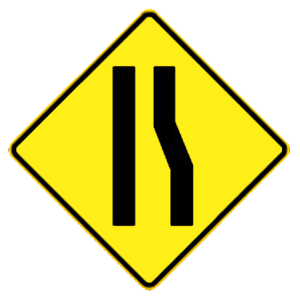 The lefthand lane is intended for use by faster-moving traffic that is passing slower-moving traffic. You are about to enter a one-way street the wrong way. Traffic turning left on the green light must yield to oncoming traffic. 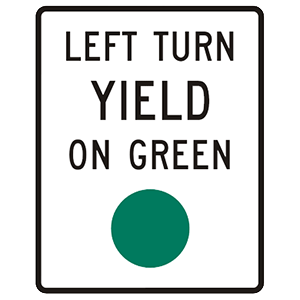 This sign is used with a traffic signal to tell drivers that left-turning traffic does not have the right-of-way and must instead wait for oncoming traffic to clear. 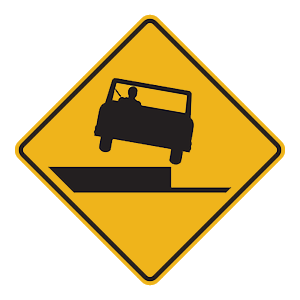 Stop on the shoulder of the road if you are tired. You should always use cruise control. Signal, check mirrors, and check blind spots before changing lanes. You should change lanes often. Signal, check your mirrors, and check your blind spot before changing lanes or passing on an interstate. Only stop on the shoulder of the interstate in the case of an emergency and change lanes as infrequently as possible. Cruise control should not be used in heavy traffic or under poor weather conditions.